There is renewed hub-bub this week about the status of state buyouts of homes at Money Island. This post is not meant as a complete rehash of the topic but rather just a short bullet point summary of what’s going on from out perspective. In the short term, nothing is changed. In the long term, we are all underwater. I’ve talk with a lot of people inside and outside government about this issue over the past decade yet I have no official indication that the state is interested in acquiring more property in Downe other than residences. 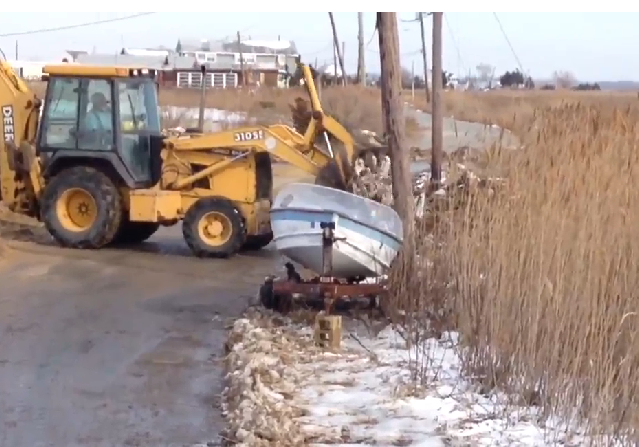 Yet that seems to be the implication of this week’s announcement by NJDEP. I am advising property owners in other parts of Downe and Lawrence township but at this time I (personally or through BaySave Corporaion) do not have any financial interests in any of these properties. I do have the right of first refusal on some properties in both townships. None of those properties are involved in buyouts. These first refusal rights preceded and are unrelated to the current buyout process. The state informally says that they are considering the 2012 offer to acquire the marina properties by gift and then leasing it back to the operators. This is a proposal I still support as being logical and sustainable. BaySave’s 2015 report on progress toward sustainability was issued in draft form and is available to anyone by request. 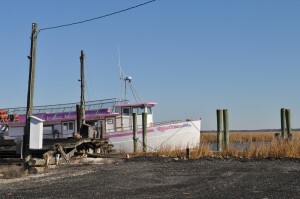 The report contains more information on the progress of properties owned by the marina. I may publish a copy online soon. More property owners in Lawrence and Downe township have come to me for help and advice regarding possible buyouts. The buyouts of some properties are moving forward. Most property owners who are offered a buyout do accept the first offer. Other than what is stated here and in other public spaces online I have no “inside information” on the process. The state’s official forecast, confirmed by every other independent source, is that we will be inundated (i.e. underwater) by rising sea level within our lifetime. 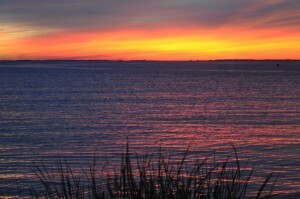 Inundated areas like Money Island are presumed to be inappropriate for residential communities. Inundated areas like Money Island can be appropriate for aquaculture and eco-tourism with government’s approval and support. We are still looking for guidance from government on whether to stay and rebuild the businesses or sell to the open space initiative and move away. 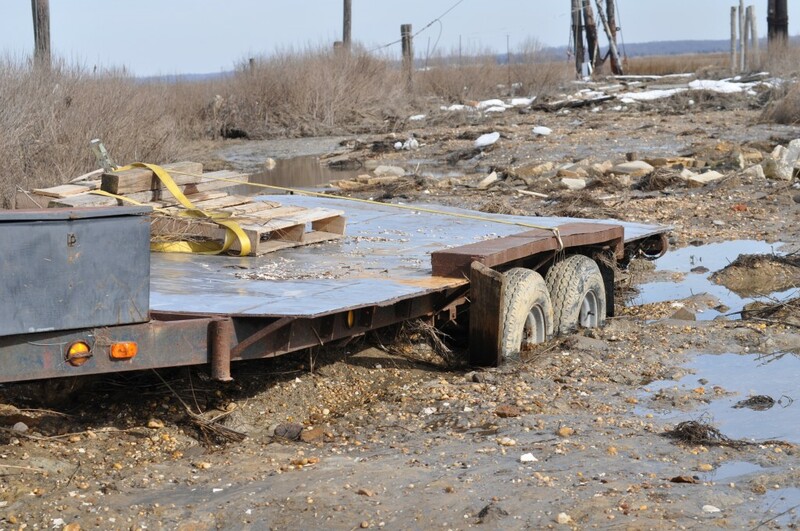 The NJDEP and Cumberland County Department of Health has been enormously cooperative in helping us resolve these issues. Downe Township has not offered any support or guidance in our business recovery and at times seems to be responding with obstacles. Many people presume this lack of support is due to the personal and legal history between me and the township. I am doing my best to bridge the communication gaps. My best guess is that the aquaculture and harvesting businesses at Money Island will remain but the residences will disappear. Presumably, then, public access to the water would remain possible but the business model of a public access marina would need to change significantly in order to survive. Perhaps it would be like Bay Point? Or perhaps a Fortescue model would be more appropriate? We just don’t know yet. There is no indication that any of this current discussion is related to last week’s storm. It is just coincidental that the storm triggered additional news and media coverage of the decade-old issue. For more information on this topic see Steve Eisenhauer’s report. This past weekend’s storm caused more problems here than we initially expected. It is quite noticeable that Money Island took one more hit in the long battle against rising water level and increased storm energy. 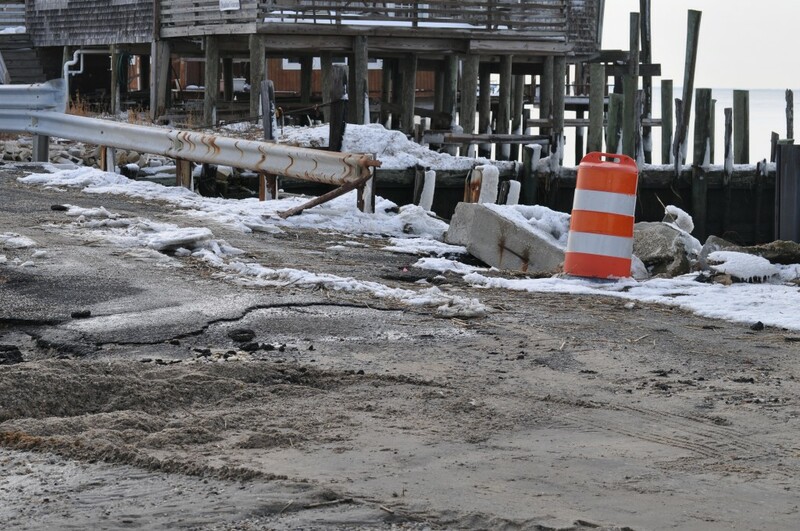 The most visible impact is a loss of more than one vertical foot of beach sand on the water side of the new Bayview Road bulkhead. That beach loss was a predicted impact of the sea wall construction but seeing it happen in real life is no less shocking. The marina lost a finger dock, a load of dock lumber and of our two dock ramps need major repairs. One neighbor’s house lost a section of siding. 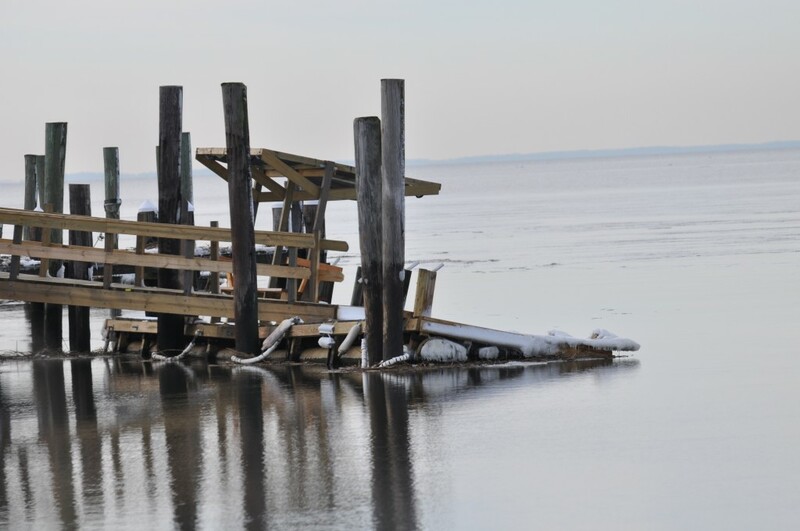 At least two of the commercial docks need repair or replacement of their flotation. Repair costs of the damaged items we noticed are likely to be in the range of $10,000 to $20,000 even with our use of primarily volunteer and uncompensated labor. One of the long term predictions about the effect of climate change is that the combine forces of sea level rise and increased water and air temperatures in that smaller storms like this will have a greater destructive impact on property. That seems to be the case with this recent storm Jonas. I noticed the irony that the newer structures seemed to incur the most damage. The old decrepit and abandoned structures here seem to have survived unscathed. We do not yet know what is caused this new dock to sink. Perhaps the air-filled floats cracked and filled with water. The floats were rebuilt in September 2015. This will likely be our most difficult and expensive repair this spring. Flowing sand across roadways and parking areas can cause headaches. There is more deterioration of the roadway at the Bayview Road bridge yet a tractor clearing debris drove over it today. 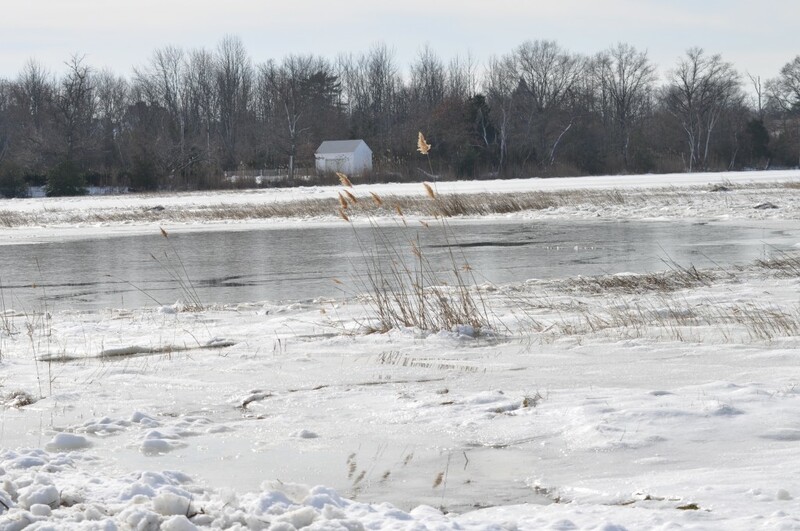 The snow and ice on the marsh was mostly melted by the end of the day Monday. We figure that eventually U.S. manufacturers of amphibious vehicles will bring the price down, but you can forget about troubles with flooded roads right now for only $155,000. We definitely see a vehicle like this in the future of Money Island residents of the year 2030. 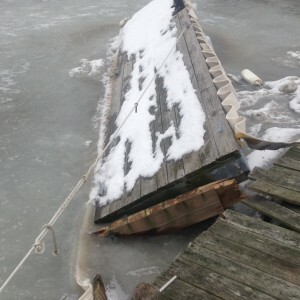 This photo shows new hardware and a safety chain connecting two sections of reconstructed floating dock. 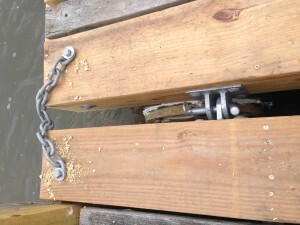 The safety chain bolts go through the 4″ beams of the dock below the deck. It the event of a severe storm the pin connecting the docks might break but the chain will likely survive. 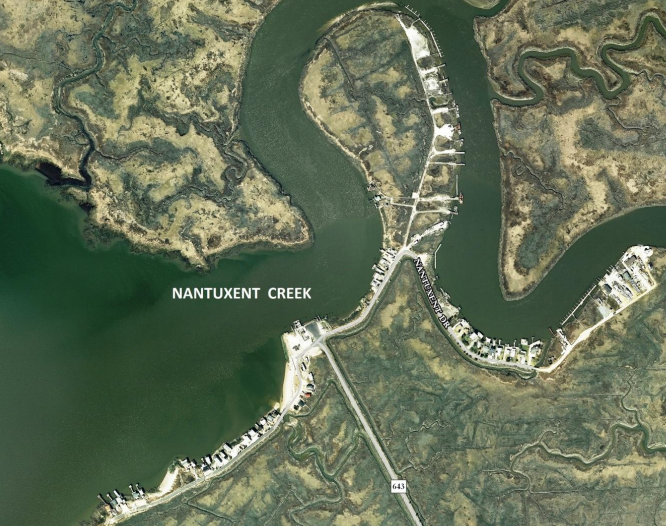 entered partnership with The Nature Conservancy shoreline stabilization project. Storm protection is an ongoing project for us but we feel confident that we’ve come a long way in the past three years. This little 2.5 horsepower 4 stroke engine is one of the most fuel efficient outboard engines made. 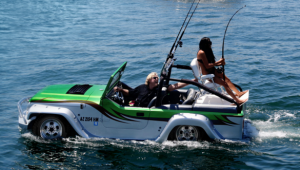 It does not set any speed records but easily moves our 12 foot aluminum rental boat up the creek for perch fishing. We thought that the sound of an outboard engine would be welcome and comforting in the middle of January. Congratulations to Tom and Samantha and their families on the birth of Thomas Todd Pew III, born 11:55 pm last night, 7 pounds even according to his grandmother. Young Tom may be Money Island’s first 3rd generation waterman.